Yeah, the PS2 version was a SImple 2000 release that included the original game and a sequel which, to my recollection, is 2.5D and not very similar to the original at all, but it's been a while. It did come out in Europe but they changed the name to... dragon something, something dragon, I forget. "Updates" since when? I feel like Switch gets another shmup every other week. Raiden V and Caladrius Blaze have both been leaked by ratings boards, who knows when they'll show up. Arcade Archives Image Fight is due any week now. Some Brazilian studio's porting & remaking the old Vasara games, no guarantees they'll do a good job but it's something. I was more thinking of "good" ones, it seems there's always naysayers for almost every one released. This is the one I was trying to think of specifically though. Glad to hear it's coming out soon! 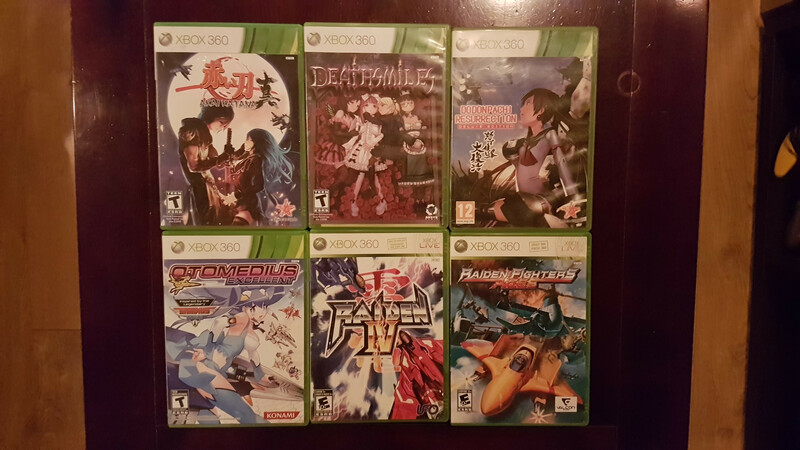 360 - - - Since I do not own a JP console, and since I like playing the shmups I own, I do not have many titles for this platform. I wish I had more and one day, I will definitely purchase a used jp 360 and triple this collection. Dreamcast - - - There are still many titles that I'm missing but I'm quite happy with what I have so far. 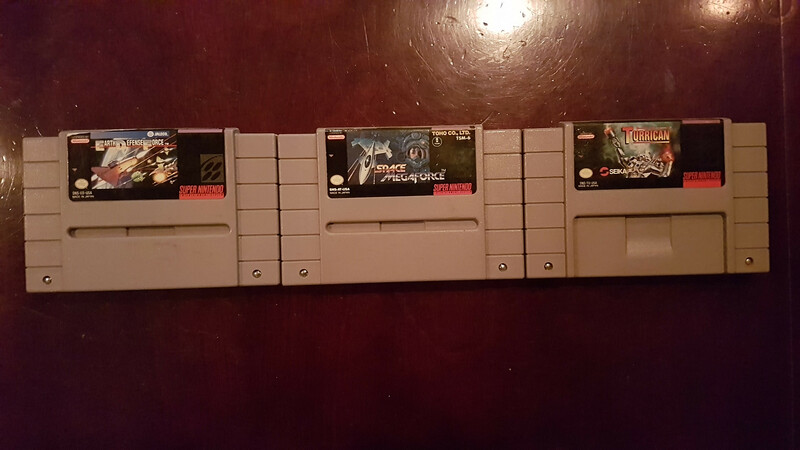 Still looking for titles such as Triggerheart, Shikigami II, Trizeal and Under Defeat. Not too much interested in unofficial post-death dc titles. Gamecube - - - Not sure how many titles there are available for this system and this lack of knowledge sure is reflected here. Genesis - - - Poor display of a collection here. So many titles that I miss it's not even worthy of anyone's time. It's also way too late to start acquiring the great shmup on this system due to the outrageous prices they commend. 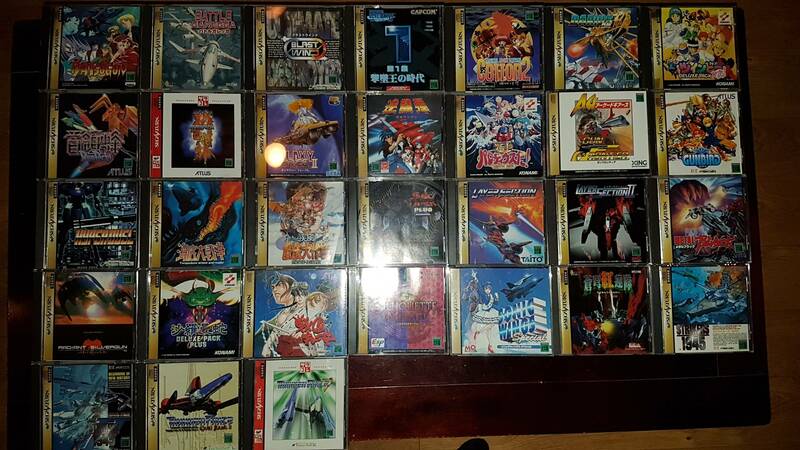 PS1 - - - Missing many key titles here, but I'm happy with what I have so far. 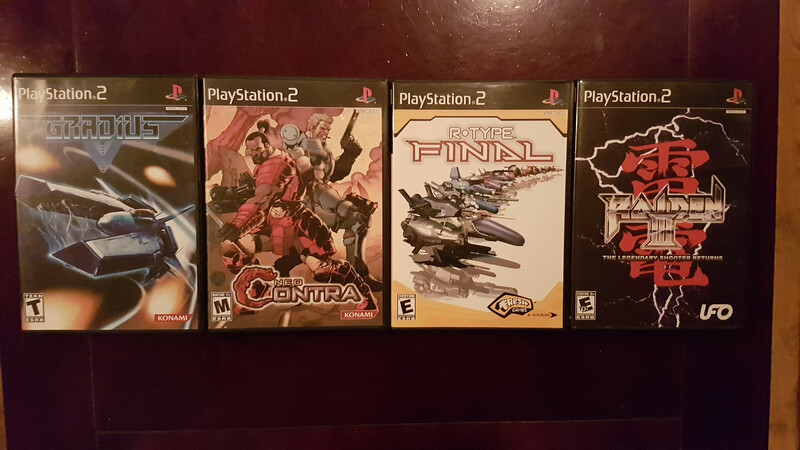 PS2 - - - I know this system has a crapload of shmup, but nearly all of them are exclusive to NTSC-J. 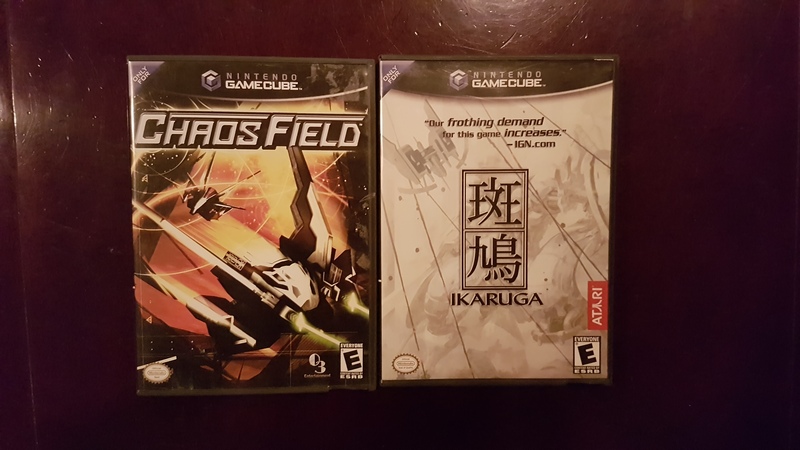 If you are aware of any shmup that I'm missing that came out in the US, please let me know (except for Castle Shikigami 2; I'll purchase it on DC). As for Famicom, well I grew up with a NES in the 80s but...I don't know how to explain it. I don't have the nostalgic vibe for it...? I don't know why. I mean, there are so many games I'd like to replay such as Jackal, Operation Wolf, Built To Win Formula 1, Indycar Racing, the NES version of Life Force (played it to death), Contra, Duck Tales, Little Nemo, etc. But at the same time, I am ok with not owning them ever again. one of the guys at STGWeekly recommended super aleste and told me to get the super famicom version. it definitely can't touch space megaforce in price but it's starting to get up there. Got another question for ya'll. I'm not a Cave fan but I do like Toaplan stuff. I've heard that the original Donpachi has some Toaplan-isms that Dodonpachi does not, but I have only ever played Dodonpachi. Is the original different enough in feel to warrant playing, particularly if I wasn't too hot on Dodonpachi? Aw. :( Fair enough I suppose. The NES/Famicom is by far my favorite console and it's got a great little library of shmups. Something about the colors and sound of NES games still really gets to me decades later. And the library is so big that I'm always discovering new games to play. And even the jank is fun. I'm not a Cave fan, but I enjoyed 'Donpachi' a lot. Still, I prefer the Toaplan stuff by a large margin, with the exception of 'Batsugun'. But from a historic point of view, it's a fascinating title. Because it was created as a love/hate letter to 'Raiden'. 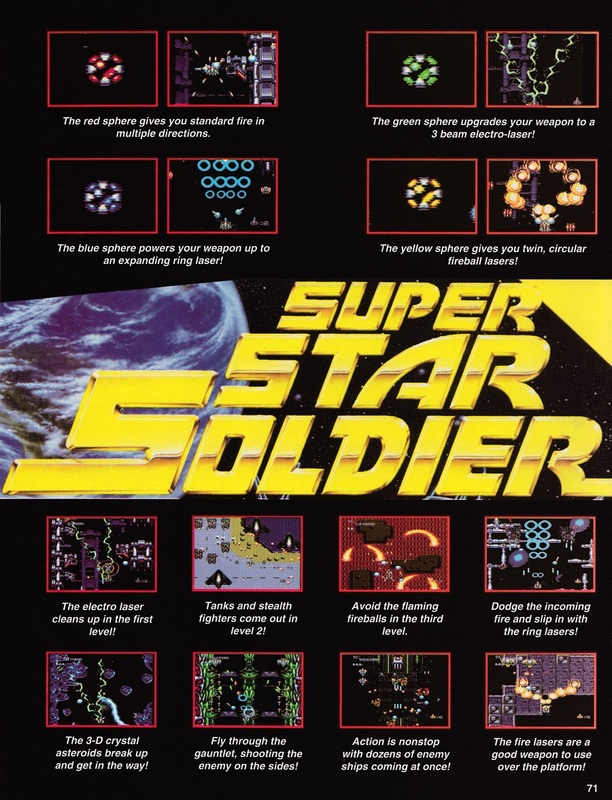 Basically, the game tries to capitalize the success of 'Raiden'. 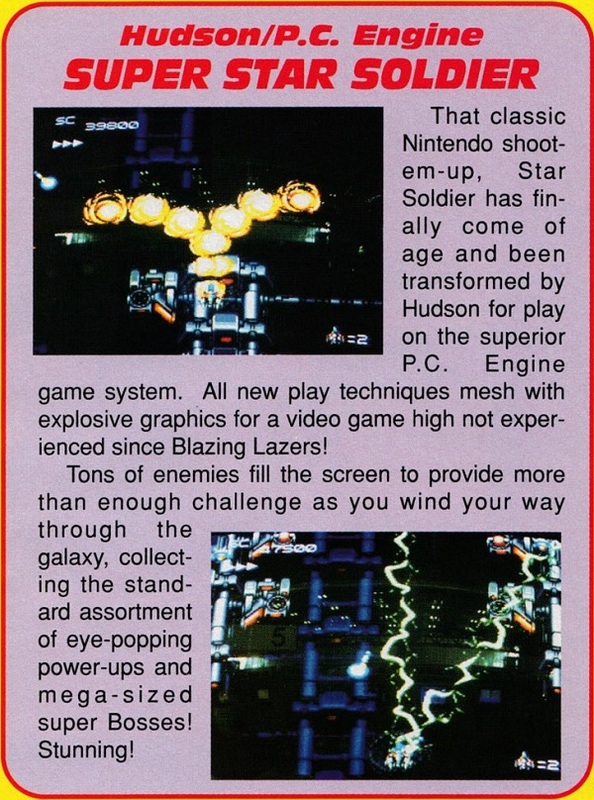 And to do this, they tried to eliminate every "annoying" thing in 'Raiden'. I prefer 'Raiden' to 'Donpachi'. But as a big 'Raiden' fan, I always find fascinating to play and analyze both games together. In the same way as I always found fascinating how the original 'Wonder Boy' was influenced by 'Super Mario Bros'. 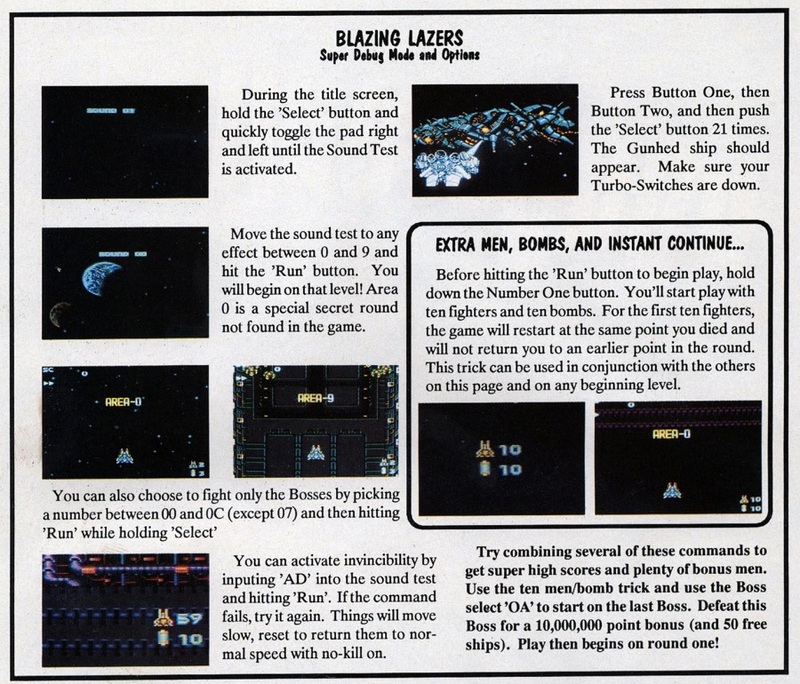 But made by someone who hated a lot of elements in 'Super Mario Bros', so he was trying to create his personal and improved version of the formula. The Dreamcast version of Shikigami 2 is a white whale for me, and god I Love the cover. 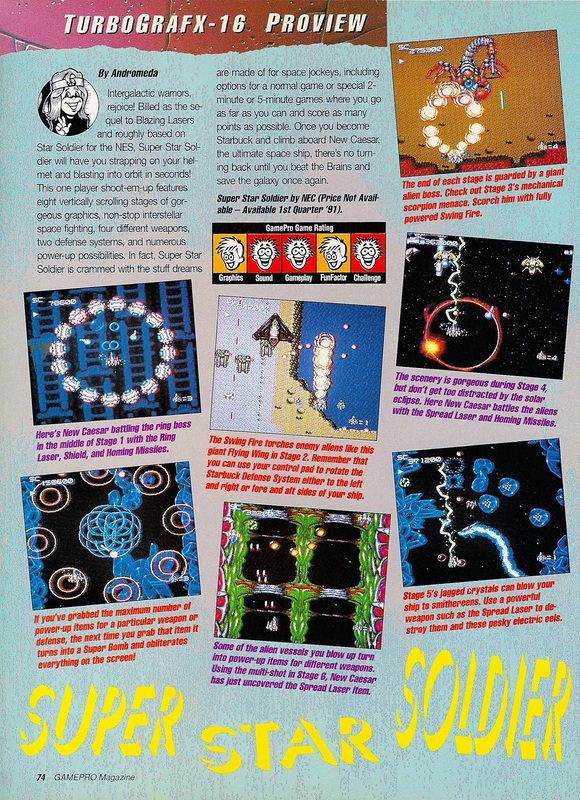 Turbografx/PC Engine shmups? That's something I have a lot of... so sure, why don't I take a picture of them? Super CD games are the top two rows (excepting Super Darius, a regular CD title in one of those rows to be next to its Super CD sequel), regular CD the next two, and JP HuCard games below (Hany in the Sky is accidentally in the loose cards row below even though I have the case; I didn't re-take the shot just to correct that.). US HuCard games are on the left side. To identify a few that may be tough to recognize, the no-manual game in the top center is Kiaidan 00. The other no manual CD games are, going downwards, Alzadick, Monster Lair, and, in the bottom left corner (because it didn't fit elsewhere in the frame), the Super CD game Ai Cho Aniki (which could be next to Cho Aniki, but oh well.). The loose card game in the bottom right, with the cord on top of it, is Armed Formation F. Oh, and the loose US HuCard game is Cyber Core. And yes, that is Rock-On with the flash's light covering the "R". 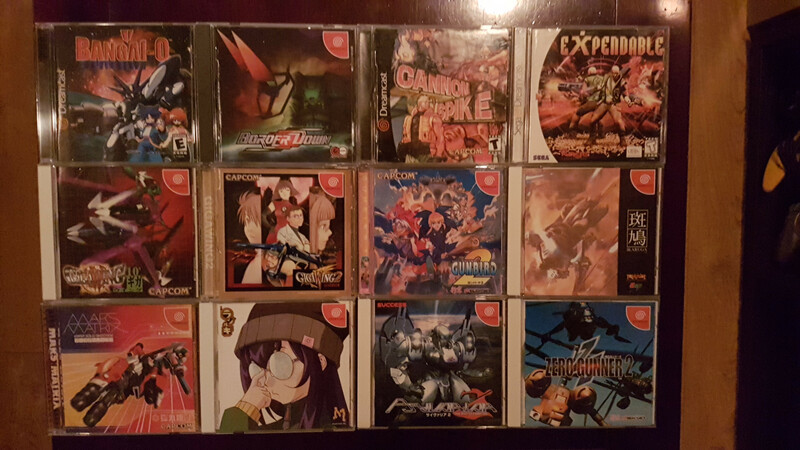 I included a few games that are only partially shmups here -- Fray CD, Monster Lair, Pomping World (aka Buster Bros.; it's kind of a static-screen shooter...), Spiral Wave (which is a space adventure game with some rail shooter parts). Close enough. Not pictured, even though it probably should be: the somewhat shmuppish tank action shooting game Metal Stoker: Neo Hardboiled Shooting, which I do have complete. 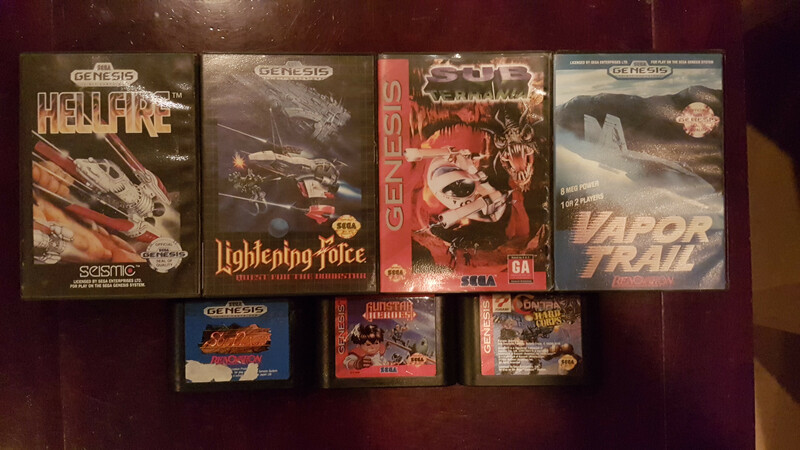 As for the Saturn though, all I've got are the Gradius, Parodius, and Twinbee Deluxe Packs, a US copy of Galactic Attack, Game Tengoku: The Game Paradise, Soukyugurentai Otokuyo, Macross DYRL, Sonic Wings Special, and kind of Assault Suit Leynos 2, though that's really not a shmup. 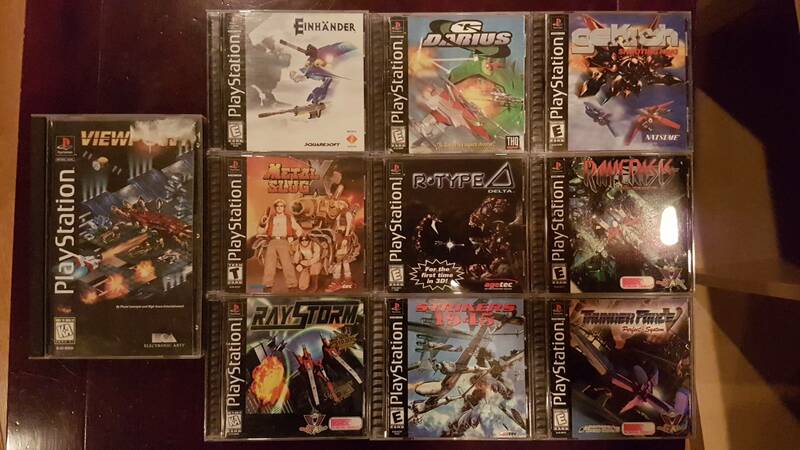 My Playstation shmup library's not huge either, I have some interesting stuff but do not have the more expensive ones like Einhander or R-Type Delta. I like 4th-gen shmups more than 5th gen for sure. I assume you are talking about the PS1 ports, right? If so, I do plan to purchase them down the road! Looking for In the Hunt on that system too! Even though I prefer Dodonpachi over the original (my favorite CAVE title), There is definitely some Toaplan feeling that its sequel does not possess. Donpachi and Batsugun have a lot in common when it comes to bullet density. They feel very similar. Batsugun is quite a step above their previous titles while Donpachi isn't quite as manic as the sequel. In these differences, they meet each other. I know what you mean. I do like the graphics and sound (the overall style) from the 8-bit NES/Famicom and I wish I had some of the great titles for the system, but the reality is that it's rather too late to start collecting them :/ Add that to the fact that I do not have this driving force to obtain them like I do for the PS1, the DC or the Saturn and you end up in my situation. If I ever strike a nice deal, I'll definitely think twice about it though! That card with Fumiko, yum. did you translate this one? No, never got around to it. Shiki1 was priority one since it had NO translation. True to form, you have hoodwinked me into getting another game -- Raiden. I've only ever played the Fighters games because I love shmups with lot so playable characters. I see that I could get Raiden on my Vita, but it's the Hamster PSX port from like 2002, so it's probably a good port but it doesn't come with Raiden 2. Incredible collection. And I agree on preferring 4th gen shmups in general. Thanks for the info on Donpachi. I think I'll probably give it a shot. Y'all are gonna laugh but I got a B grade on Ikaruga stage 1 and made it all the way through stage 3 on a single credit this morning.... (on easy)... and I feel like I just won the lottery or something. now just to get a little better with my chain abilities and nab that A grade trophy... one day I suspect I will be good enough for stage 4. Anyway, it appears this setup is one of the strongest available due to the fact that the super cdrom 2 is quite reliable unlike older unit. Duo R and Duo RX were simply too expensive. Actually, this combo I just won is normally around Duo RX prices so I guess I got lucky on this. I'm not even much of a Fantasy Zone guy and still, if you guys have been snoozing on Black Bird... Stop it. Does anyone know if there is a thread or list somewhere keeping track of all the Shmups available on the Nintendo Switch? I spied a few references in this thread to games and collections that I can't find in the US eShop. I'm guessing they're available in other countries? Watched some video of this last night and added it to my wishlist thinking, "I'll get it eventually." The next day, a sale appears! Black Bird and Mars: Chaos Menace are on Steam sale. Grabbed them both there. aaaand Graceful Explosion Machine is only $6.49 in the Nintendo Switch eShop. i guess there's a new sale coming through. Saw a video for AngerForce: Reloaded on the eShop the other day (seems to be out on all platforms), it looked...interesting. In particular the bullets and patterns looked a lot like Psikyo stuff. So I grabbed Black Bird for Switch and this game is wild. I am still trying to figure out exactly what's happening. It seems like random environmental damage allows for a lot of extra points, but I'm not sure if the damage is always random or if I have to shoot down targets in a certain order to trigger outcomes. Other environmental damage seems consistent, but only sometimes spawns power-ups or bombs. No idea why. Am I shooting too quickly? Not quick enough? Combo is definitely a matter of picking up the green crystals and leveling up. Green crystals shrink the more they bounce on the ground. Bomb combos generate huge bonuses, but also sometimes extra bombs? This is also unclear. There are also seemingly random events in every stage that I cannot for the life of me figure out. They're maybe time-based? Or maybe the order I shoot down the stage's targets? It's all surprisingly engaging. The most intriguing bit to me right now is that you get bonuses for time and for number of kills, but time is obviously part of what enables a bigger kill count and I think it's what triggers at least some of the events that make big combos possible. I don't think I've ever played anything like this. Huge and pleasant surprise. Yeah, Black Bird is a treat. It's too bad the old Love-De-Lic games aren't widely accessible. Is the Irem Arcade Hits collection on PC decent? I wanted to get it mostly for R-Type Leo, In the Hunt, and Gun Force II but then I saw it was handled by DotEmu. :/ Many of their emulation and port jobs are downright despicable. IIRC, the Irem PC collection includes the roms, so you could run them with a different emulator. I'm probably wrong though. It's been awhile. Pretty sure it does include the roms. I tried the same thing with Raiden Legacy, but just dropping the dotemu game files into MAME didn't work, and I didn't feel like putting any more effort in, so I moved on. BUT, I'm so glad others have found this gem of a game. Hope everyone who loves shmups gives it a chance. When you have a good combo going in the later levels, the entire screen is absolute chaos, and I love it. I don't believe there is any other shoot 'em up quite like this game - the aesthetics, art design, and that bizarre yet hilarious music mixed with combo rampaging through the levels like some ghostly bird godzilla. Just picked up Graceful Explosion Machine yesterday after a long time on the wish list. Seems good so far. Does anybody here own either the Turbografx-16 or PC Engine port of Raiden? Was thinking about picking it up even though I have the import version of the Raiden Project because I enjoy trying out different home ports. Are there any regional differences between the TG-16 and PCE version (like fairy restart checkpoints from the Japanese arcade version, ect)? 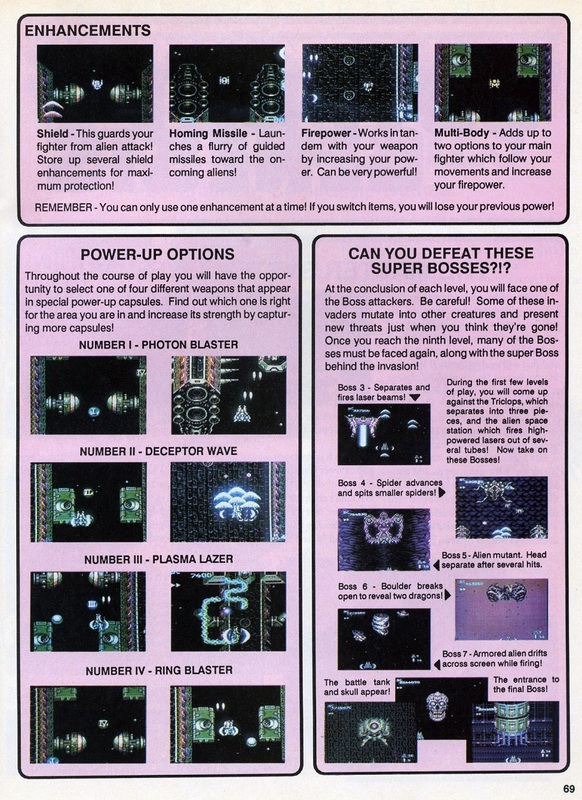 Also if anyone has it and it’s not too much trouble I’d love to see pics from PCE version’s manual if it has any nice art. :) That would also help me decide between the U.S. and PCE version. I have Super Raiden on the PC Engine, which is mostly the same as the hucard version I THINK but with better audio. I'll try to get some pics of the manual tomorrow, just heading to bed now. 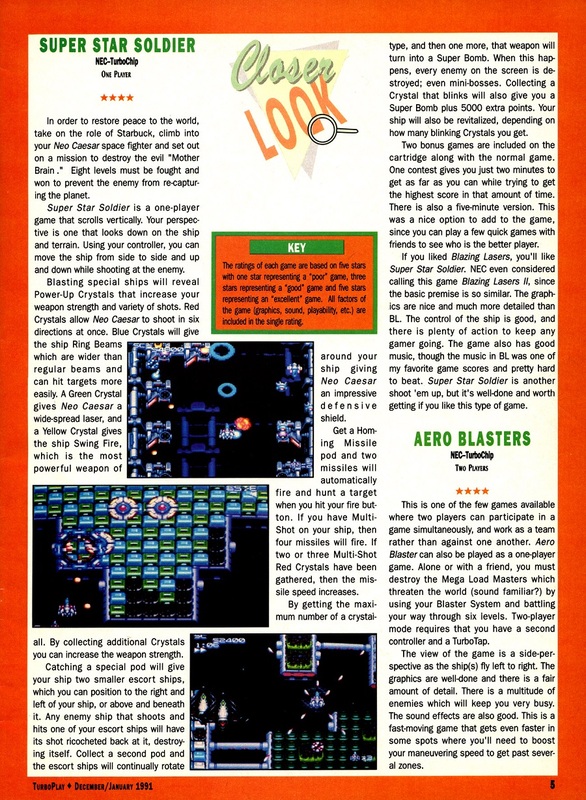 Speaking of PC-Engine / TurboGrafx-16, I've been wanting to get back into Gunhead/Blazing Lazers, and the entire Soldier series. 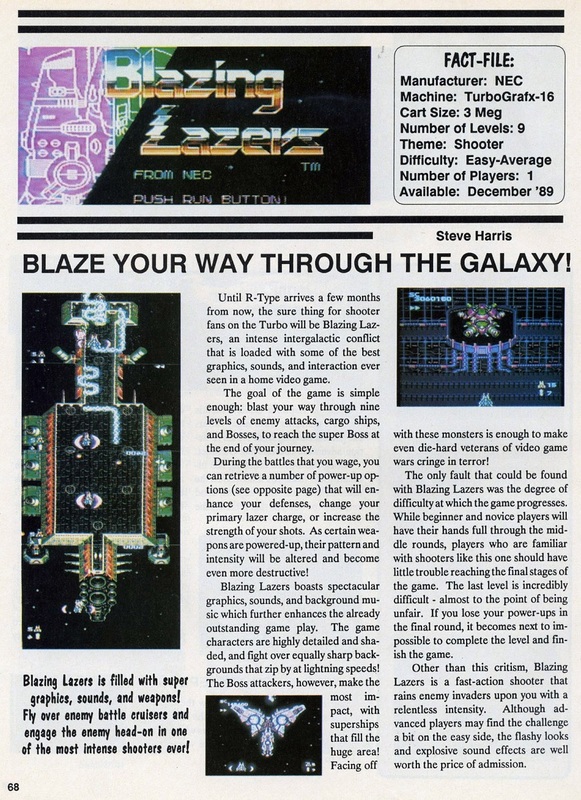 Some coverage of Blazing Lazers from '89. 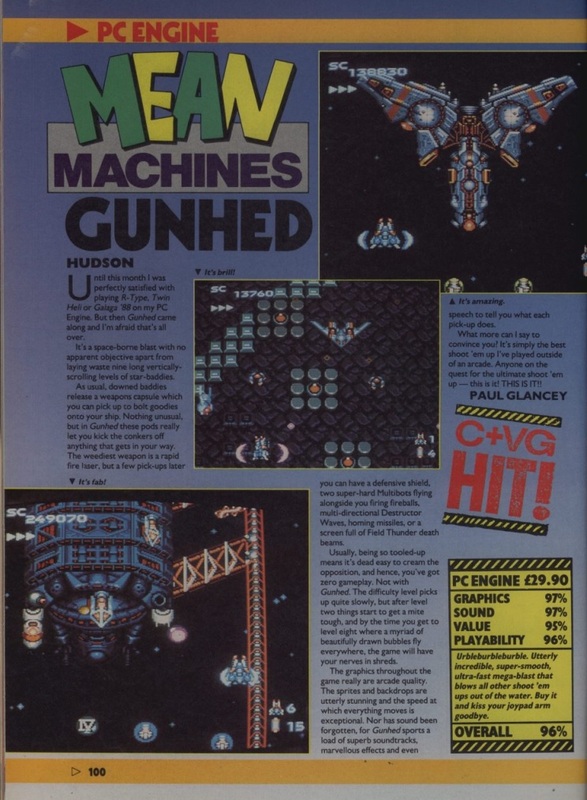 I could never manage to get a copy of Gunhed when I bought my PC Engine - that and Legendary Axe seemed to evade my purchase and were my most wanted games - spent so much time on Super Star Soldier (and Heavy Unit) though. Here’s a great vertical scroller that I do enjoy though - thanks for posting these scans! 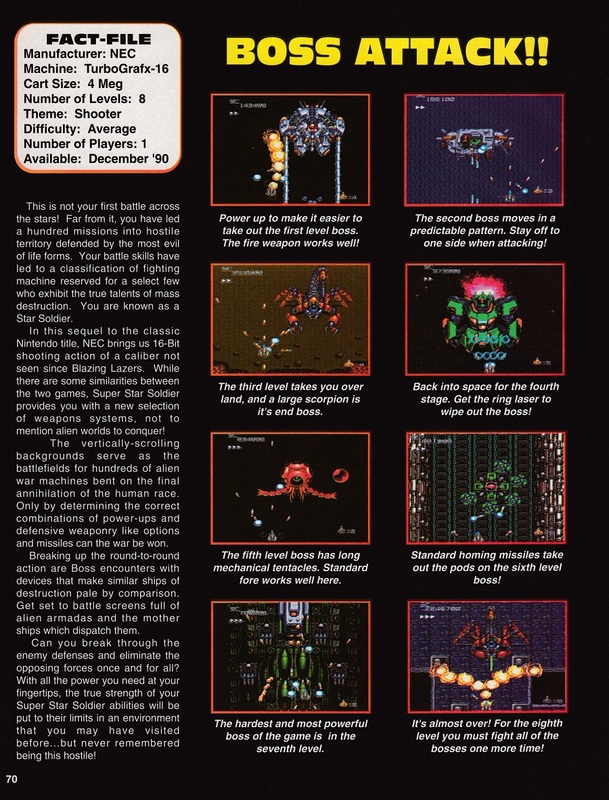 It seems that most of the acclaimed vertical shmups were on hucards and most of the good hori shmups were on the CD. Or maybe I’m off on this assumption? 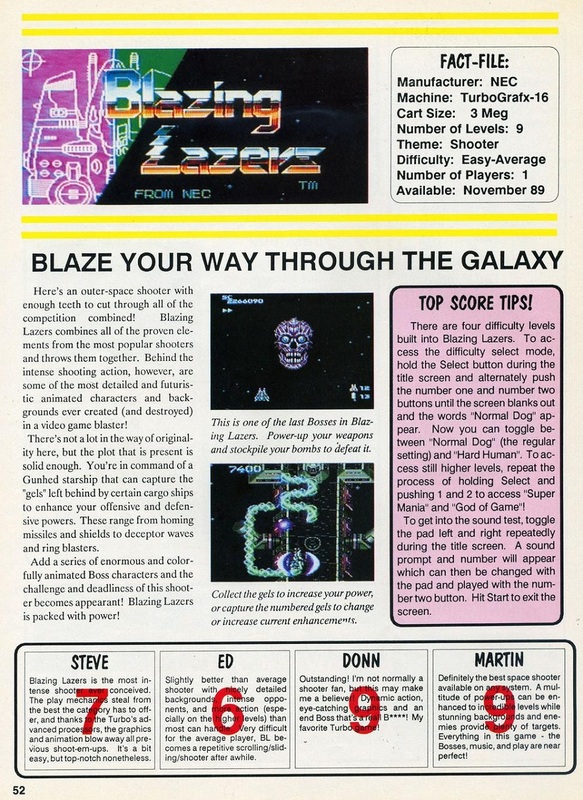 SharpX68K Those Blazing Lazers magazine scans are great, thanks for posting. I own Summer Carnival ‘93 Nexzr Special, got a brand new sealed copy off eBay fairly cheap way back in 2000 before price went up. As far as I know it’s just Nexzr with additional Carnival modes as you said. Several months ago I played it for the first time in years and yeah, the main game can be frustratingly hard. 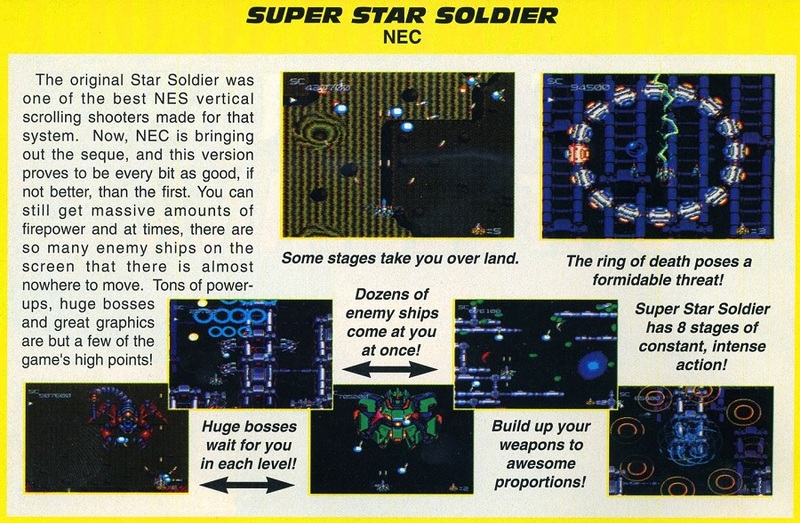 The weapons are awesome though and the game actually makes decent use of the Super CD format with some nice effects here and there (zooming and stretching on the giant battle cruisers phasing in during the first stage as one example). On another note, shmups I’m chilling to this weekend are Magical Chase on PCE and Xexex (on the Salamander Portable PSP Collection). Guys making me feel bad for selling my like new US Magical Chase a few years ago. Honestly it was thousands and I wish I had kept it. Bought it new back in the day. 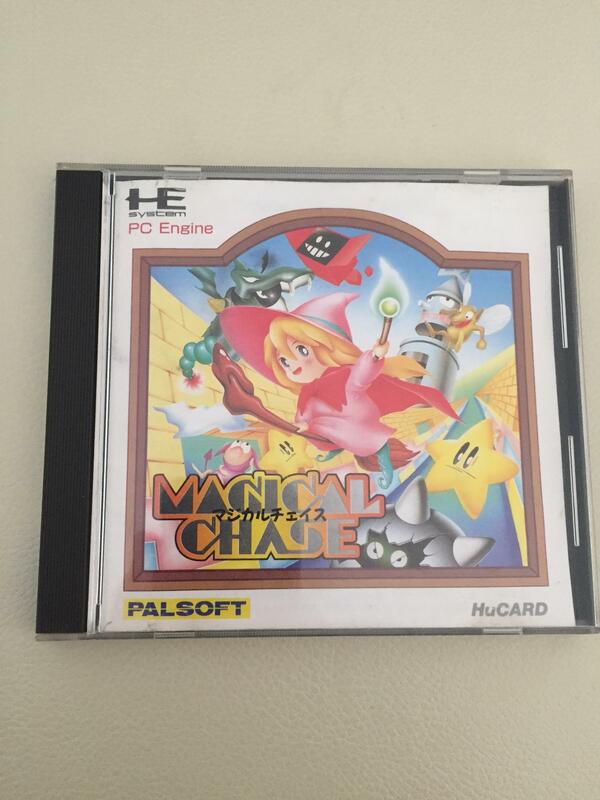 Eh, I once owned the U.S. version many years ago but I prefer the PC Engine version anyways because Quest/Palsoft made too many odd changes when they localized it for America such as completely redesigning Ripple’s sprite which causes her to look much less cute and charming than she does in the PC Engine version. She’s also much less animated in the U.S. version, she basically just sits on her broom which fires your shots in a static manner whereas the PC Engine version has really nice animation of her smiling and directing her shots from her wand every time you fire. Edit: Correction, had a bit of a false memory on that. Just watched a bit of footage from the U.S. version and there is still animation where she fires from the wand (not the broom itself) but the smiling animation from the PCE version is gone and the sprite’s overall appearance was redrawn as said before. They also replaced the very colorful toy block castle foreground and background in the first stage and replaced it with the rather drab and bland looking brown/green colored wooden bridge/grass setting in the U.S. version. Way back in ‘96 when I got my U.S. copy from Turbo Zone Direct I was like “Huh? What’s with the brown/green first stage? Where’s the toy block castle? 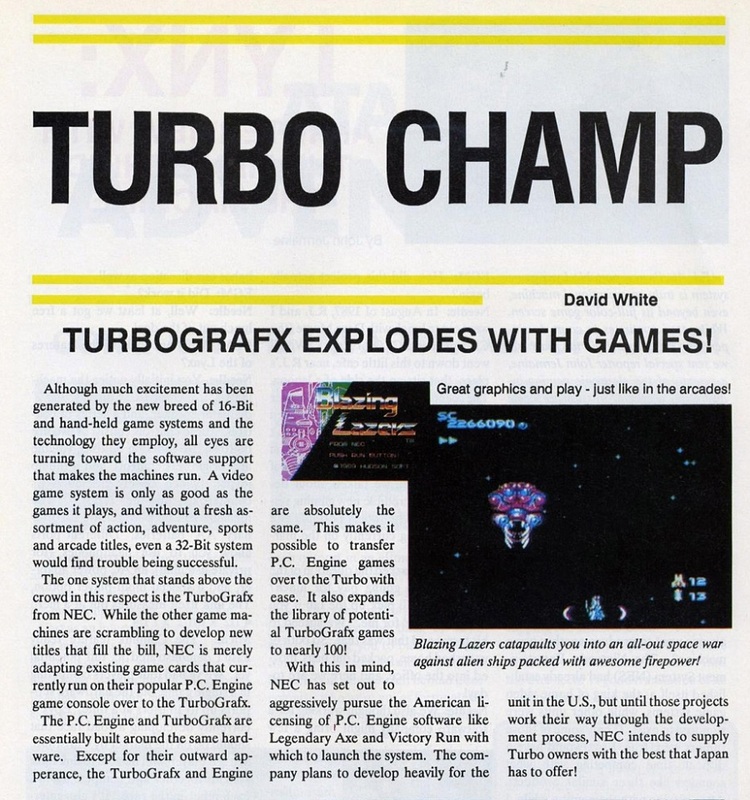 ?” (which the TG-16 “Club Turbo” preview catalogs actually used to promote the game back then). Plus getting it on PCE is so much more affordable, got that copy a year ago in great condition for $400. Otherwise if I really want to experience the American version again with its differences I can always fire it up on an Everdrive. Eh, I once owned the U.S. version many years ago but I prefer the PC Engine version anyways because Quest/Palsoft made too many odd changes when they localized it for America such as completely redesigning Ripple’s sprite which causes her to look much less cute and charming than she does in the PC Engine version. She’s also much less animated in the U.S. version, she basically just sits on her broom which fires your shots in a static manner whereas in the PC Engine version she smiles and directs her shots from her wand every time you fire. They also replaced the very colorful toy block castle foreground and background in the first stage and replaced it with the rather drab and bland looking brown/green colored wooden bridge/grass setting in the U.S. version. Plus getting it on PCE is so much more affordable, got that copy a year ago in great condition for $400. Otherwise if I really want to experience the American version again with its differences I can always fire it up on an Everdrive. I don't remember all the differences, but it was the nostalgia of having purchased that new when I was broke and $30 was a lot (or whatever). There’s a site which goes over all the localization changes in detail but forget the link. My copy cost $40. Got it along with a new copy of Shockman for about the same price, good times. 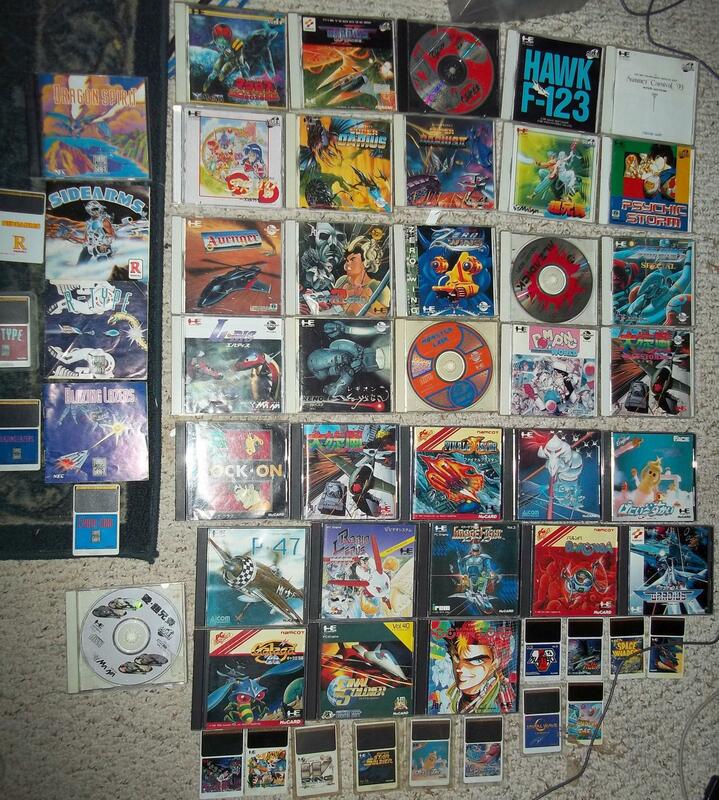 The PC Engine is the number one console I want to collect for but can't due to the expense. Thankfully some of the great games on it have been ported but there are a ton that are MIA. I hope to be able to get one some day and build a nice library for it, but I know prices are never going to decrease. It's my favorite system that I don't actually own. I wonder if I shouldn't prioritize PlayStation stuff first though, since there aren't very many I actually want and prices are only moderately inflated for a lot of them, rather than through the roof. But then I think about how many games are slightly better on Saturn and then I regret not getting a Saturn years ago. PC Engine is a blast to collect for and also has devices like the Turbo Everdrive and SSDS3 available. 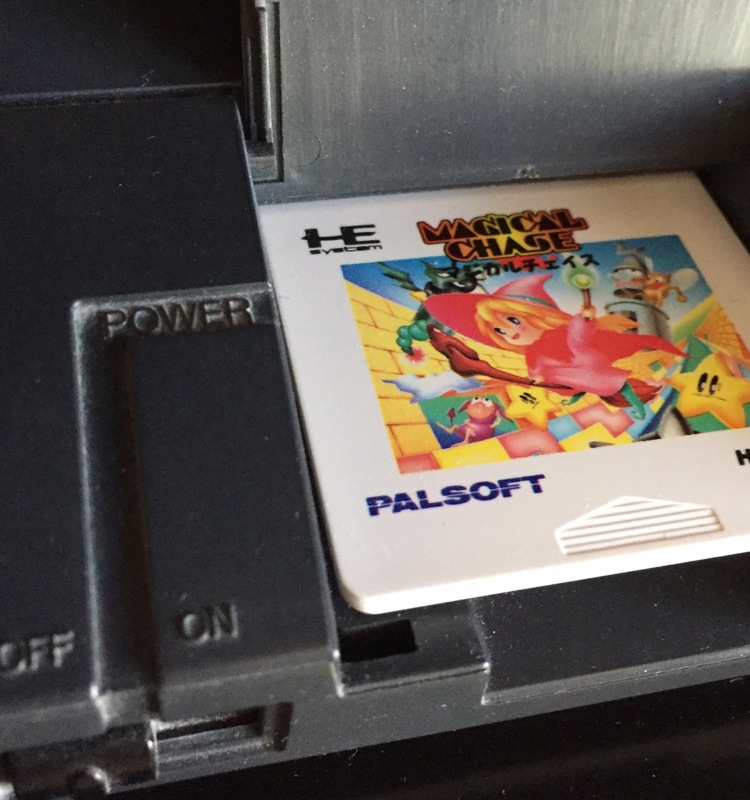 The HuCard games are like really fun NES games - in fact, the whole system feels like an turbocharged NES in general. Now is the time to snag a base unit, as prices don’t seem to be dropping! And if you don’t mind collecting HuCard only (without box/manual), PC Engine is not too pricey to collect for - but not quite affordable. I buy mostly Japanese PS1 games, except for the RPGs and other games that highly benefit from English - that keeps prices relatively low for my purposes! The NES is my favorite game console, and I think that's partially what appeals to me so much about the PCE -- it seems to have a similar spirit. If I do want to be able to play CD games, do I want a base PCE model with add-ons, or is it better to get a Duo? I don't mind loose HuCards. And I'd imagine I would only collect Japanese releases. I had a PlayStation growing up but I just don't have much interest in the 32/64 bit era these days outside of the games I already have. I'm only really interested in the shmups and the odd RPG or platformer. I don't have the drive to hunt for oddities and hidden gems for it like I do for earlier console generations. ...If I do want to be able to play CD games, do I want a base PCE model with add-ons, or is it better to get a Duo? I don't mind loose HuCards. And I'd imagine I would only collect Japanese releases. It’s a little outside the scope of this topic, but yes, most would say the Duo is best - be aware that you’ll probably need a full recap on it. However, only the base units can utilize the SSDS3, which is essentially an Everdrive for both HuCard and all CD games. Come on over to the PC Engine Thread and we’ll get you squared away! The topic could use a few more folks to liven the conversation, too. 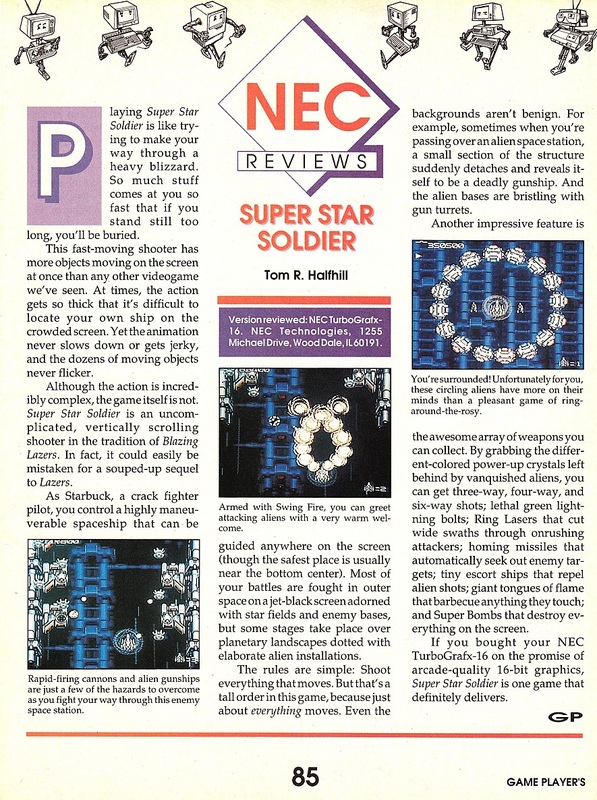 Here's Super Star Soldier coverage from 1990/1991.